When I was asked to describe myself and my interests for a bio at work I floundered. I felt the same way when sitting down to write this. Where do I even begin? For my bio, I decided instead of narrowing it down I’d go with “jill-of-all-trades.” I really like to do everything and if I don’t like something I only know that because I tried it first. I’ve been this way since I can remember. At school I got good grades in everything (except Chemistry), I liked everything (except Chemistry) and I wanted to do everything. Figuring out my career path was therefore a long process (I actually started out pre-med in college, but you know… Chemistry). After graduating college I started working in marketing and absolutely hated it – I did the same exact thing almost every day. It was miserable. I missed the old web content job I had during college, where I did SEO, product photography, email campaigns, basically anything website related. Right now I can’t believe there was a point in my life that I missed HTML emails, but I did. I missed the flexibility, doing something different every day, and most importantly, I missed the creative problem solving it entailed. So I quit my stupid marketing job and attended a coding bootcamp. I can’t say that I loved WordPress right off the bat. When I was still mostly developing pretty simple sites with it, I was afraid it was going to become monotonous. Today I know how wrong I was. Although the majority of the projects I work with involve WordPress, I can do something new and different with every site. Just this year I’ve worked on a WordPress theme with a headless React front end, a WordPress site with part of the admin area written in React, and a WordPress plugin with a front end built in Angular 2. Even traditional WordPress themes can be exciting. Each client has their own needs and with the flexibility of templates, post types, and widgets every site I build is a new challenge. I’ve come a long way since drowning in monotony early in my career. At home you might find me doing yard work, refinishing furniture, knitting, wood burning, or attempting to play the banjo. 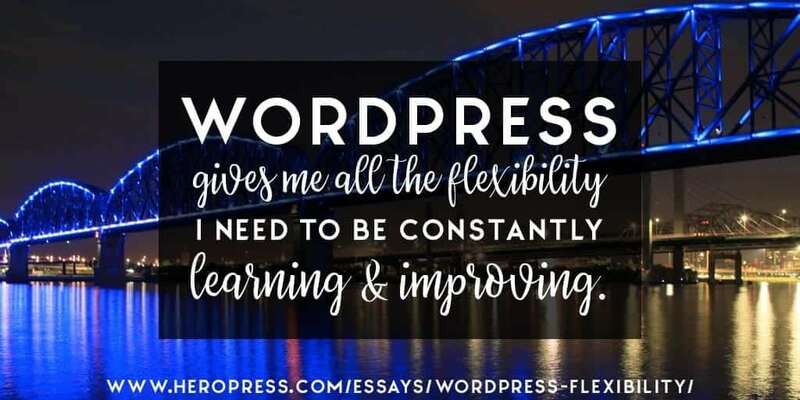 But at work, using WordPress gives me all the flexibility I need to be constantly learning and improving. The post WordPress Flexibility appeared first on HeroPress.